“I am one of those people who, like Nobel, believe that humanity will draw more good than evil from new discoveries” – Marie Sklodowska Curie. Acknowledging the idea that radiation can be harnessed for benefitting humanity was one of the stepping stones upon which the foundation of the radiation sciences was built. Today, as we stand upon the shoulder of giants, we realize how far we have come and the responsibilities that lie upon us to lead the fraternity to explore new frontiers. The path ahead is certainly not easy, but the vast experience of our predecessors continues to be a guiding light. As we gather for the 50th (Golden Jubilee) Annual Conference of the Society of Nuclear Medicine, India being organized by the Department of Nuclear Medicine, PGIMER, Chandigarh, it is pertinent that we revisit history and explore the journey of this department from its inception to where it stands today. The Department of Nuclear Medicine at PGIMER, Chandigarh was initially conceived in the form of a radioisotope laboratory under the Department of Biophysics, for carrying out various in-vitro tests. Dr. M.M. Rehani and later Dr. C.M. Pathak from the department of Biophysics were the key persons in running the services of this laboratory. The first gamma camera, a ‘Picker international’ make, arrived in 1989 with the department being assigned as an independent unit in the same year. Dr. I.S. Anand was the first acting head of the department, followed by Prof. B.K. Sharma, Prof. S.D. Deodhar and Prof. S.K. Jindal. Dr. C.M. Pathak continued to work in this independent department in addition to his duties in Biophysics till early 1998. Dr. B.R. Mittal was the first regular faculty to join the department in 1995, taking over as head of the department in 2006. The same year, the first MD batch of Nuclear Medicine was admitted in PGIMER. 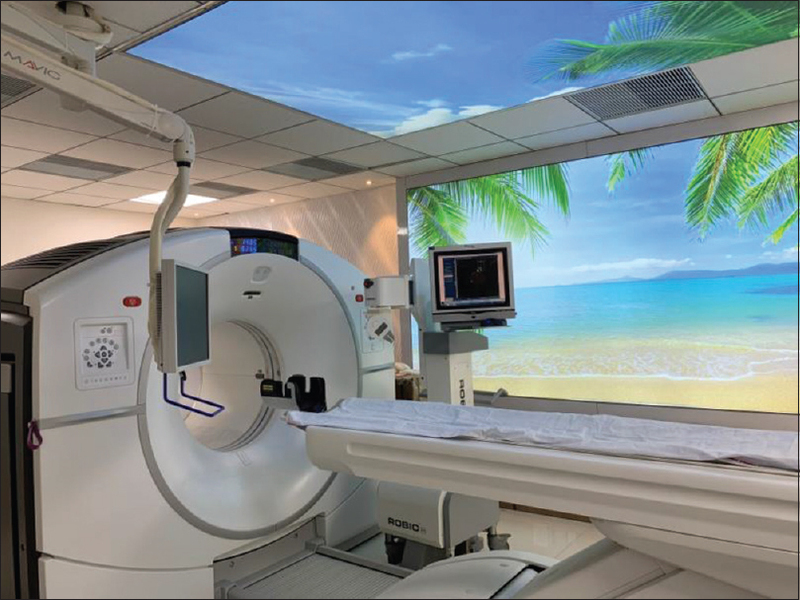 The PET center was formally inaugurated in the year 2009, in the vicinity of the department, complete with a GE Discovery STE16 integrated PET/CT scanner and a 16.5 MeV PETtrace cyclotron. The year 2012 marked the opening of a separate unit of the department in the Advanced Cardiac center with the mission of providing dedicated nuclear cardiology services with a Philips Brightview-XCT dual-headed gamma camera. Fast forward to 2018, and the department is structured in the form of four self-equipped units; General Nuclear Medicine with SPECT and SPECT/CT imaging, Nuclear Medicine Therapy OPD/Ward, PET center and Nuclear Cardiology center. Apart from this, emergency services including lung perfusion scintigraphy (99mTc-Macro-aggregated albumin), Meckel's scan (99mTc-pertechnetate), gastrointestinal bleed studies (99mTc-labelled RBC's) are available round-the-clock with a dedicated emergency on-call number. The department also has a separate lab for various in-vitro procedures. 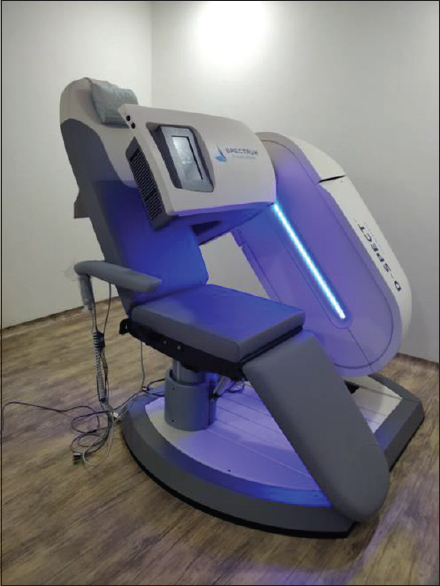 The Nuclear Medicine Therapy OPD/Ward handles patients with Graves' disease and various thyroid malignancies, providing diagnostic services and 131I therapy and a host of other radionuclide therapies [Figure 2]. The present therapy ward is a two-bedded unit with planned expansion into a four-bedded ward in the new 250 bed extension of the hospital by the year end. Patients with inoperable neuroendocrine tumors and metastatic prostate carcinoma are provided radionuclide therapy (PRRT with 177Lu-DOTATATE, 177Lu-PSMA radioligand therapy). Patients with intractable bone pain secondary to metastatic cancer are offered bone pain palliation (177Lu-DOTMP). 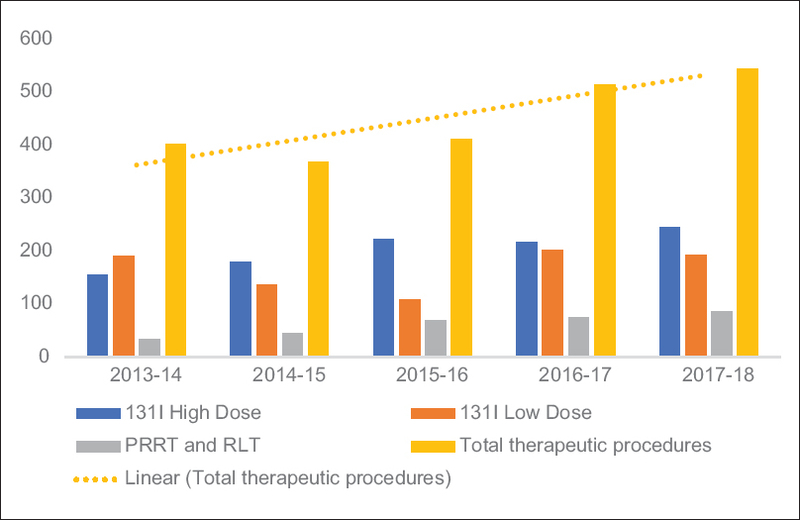 In collaboration with the department of Radiodiagnosis, TARE therapy using 90Y-microspheres and selective internal radiation therapy, using 188Re-lipiodol (indigenous) is being provided to patients with hepatocellular carcinoma. Radiosynovectomy is being offered to patients with PVNS and other forms of arthritis. Routine PET/CT guided biopsies are also performed for aiding diagnosis and guiding management in various oncologic and non-oncologic conditions. 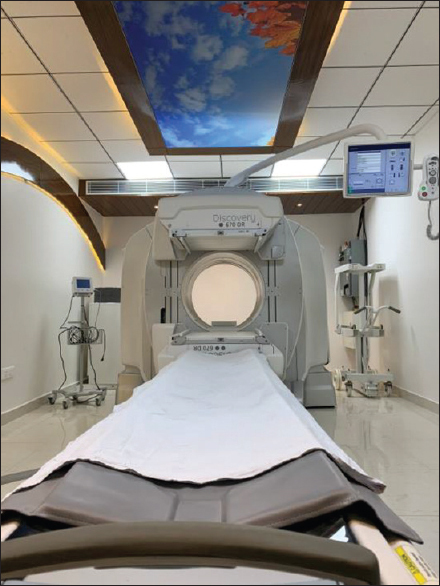 The Nuclear Cardiology center, equipped with a Philips Brightview-XCT dual headed gamma camera and the latest state-of-the-art D-SPECT (dedicated CZT cardiac camera, D-SPECT by Spectrum Dynamics – 1st installation in India) provides dedicated services in the Advanced Cardiac center. Stress Myocardial perfusion scintigraphy (99mTc-MIBI, 201Tl-chloride) and gated radionuclide ventriculography (MUGA) are performed on a daily basis. Coronary flow reserve estimation studies are also performed. On the research front, the department takes pride in having regular contributions from the faculty, residents and other students in various national and international journals of repute [Figure 3]. 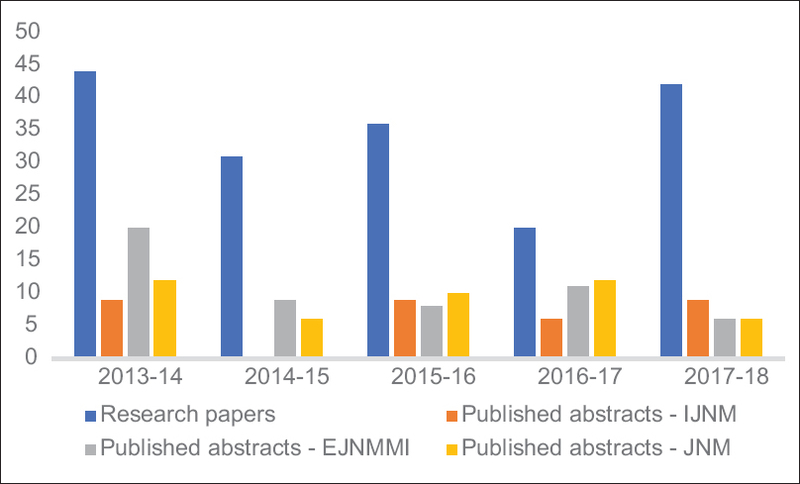 While the number of papers published from the department in Medline indexed journals in 2017-18 (April, 2017 to March, 2018) was 42, at the time of writing this article, this years' count (April, 2018 to October, 2018) already stands at 49. 22/49 of these research papers have been published in Clinical Nuclear Medicine (Impact factor 6.281), the official journal of American College of Nuclear Medicine and presently ranked 6/127 in Radiology, Nuclear Medicine and Medical Imaging journals worldwide [Figure 4]. 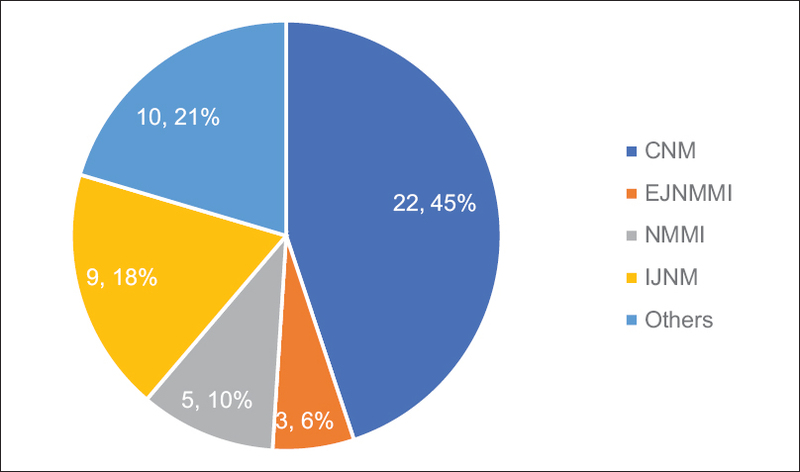 Enthusiastic participation is also noted in various national and international conferences from the members of the department, presenting the findings of the undergoing research projects [Figure 2]. The department has been conducting multiple research projects, both intramural as well as those sponsored by external agencies, such as Department of Science and Technology (DST), Government of India, Indian Council of Medical Research (ICMR), International Atomic Energy Agency (IAEA) etc. The present conference is the 4th SNMICON to be organized by the Department of Nuclear Medicine, PGIMER, Chandigarh with the previous ones being organized in 1986, 1997 and 2010. The department also organized the annual conference of Nuclear Cardiology Society of India (NCSI) in the year 2005 and that of Indian thyroid society (ITSCON) in 2007. The department has a well-structured academic programme for the MD residents, MSc and PhD candidates in the form of Journal clubs, seminars, case presentations, Physics and Radiopharmacy practicals. Interdepartmental joint interactive discussion sessions are continued on regular basis (weekly) with the residents and faculty of Urology, Nephrology, Pediatric Surgery, ENT and Endocrinology departments. The department also has an active participation in the Lymphoma, Thoracic oncology, Head and Neck oncology rounds and Clinico-pathologic meets. The departmental members also routinely take part in the CMEs, symposia and workshops organized in the institute to gain an inter-disciplinary perspective towards approaching the patients. Presently, the department comprises of seven tenured Faculty members, 22 Residents (seven senior residents, 15 junior residents), six medical Physicists, junior/senior demonstrators, technologists, PhD candidates, MSc trainees, and other supporting staff. The faculty members of the department are renowned leaders in the Nuclear Medicine fraternity, worldwide and hold several key positions in various national bodies. Prof. B.R. Mittal, head of the department, is currently the Dean, Indian College of Nuclear Medicine and the Editor-in-Chief of Indian Journal of Nuclear Medicine. Prof. Baljinder Singh is the President-elect of the Society of Nuclear Medicine, India. To ensure an all-round development, the department encourages and witnesses active participation of its members in various sport tournaments, debate and extempore competitions, essay-writing events and in leadership roles in the Association of Resident Doctors at PGIMER. The residents have been consistently winning accolades for the department at these Institute and inter-college events, managing to pursue their hobbies despite the hectic work schedule. 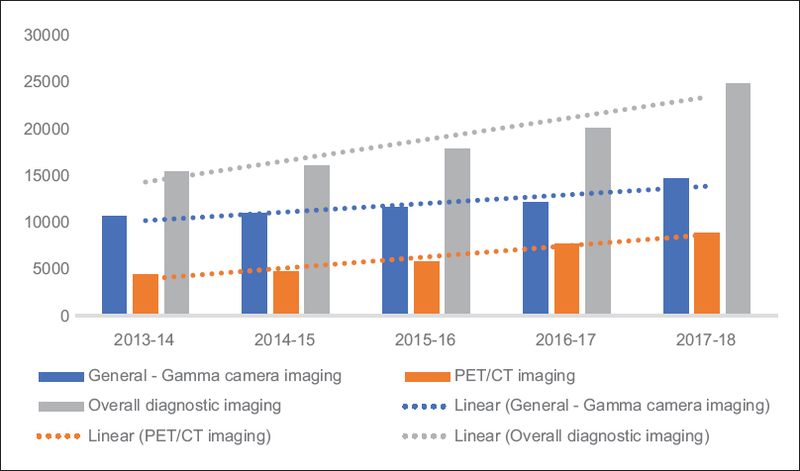 As a whole, the Department of Nuclear Medicine at PGIMER, Chandigarh stands devoted to its cause and commitment for providing better patient care through innovative research, state-of-the-art facilities [Figure 5], [Figure 6], [Figure 7] and widening the outreach of healthcare services to reach every stratum of the society. The department owes its existence and exponential growth to men and women with futuristic vision who worked tirelessly to ensure that the specialty realizes its potential and becomes an inspiring landmark for others to follow.